Zener diodes conduct not only in forward direction but also in reverse direction when the applied voltage is larger then the zener voltage. This effect is used to stabilize voltages. Zener diodes are part of a power supply. 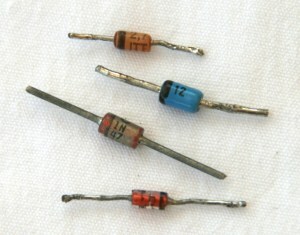 Different zener diodes. The zener voltage is always printed on the body but often difficult to read. The zener diode is used in reverse-biased mode with a resistor in series. The resistor is always needed to limit the current. The voltage drop across the zener-diode is stable within the diode limits and is as high as the diode specification. Diodes from 2.4 V to 100 V exist. The most common ones are for voltages between 2.7 V and 15 V. The power rating of zener diodes ranges from 500 mW to 2 W.
For zener diodes many different symbols exist. The so called zener effect is used to stabilize voltages. Therefore the zener diode is used in reverse bias and in series with a resistor. When the voltage gets higher than the zener voltage, the diode shorts and stabilizes itself at this specific zener voltage. The excessive voltage drops across the resistor. The voltage across the zener diode is stable. Note that zener diodes always operate in reverse bias. European ZD-types or ZPD-types are easy to identify. 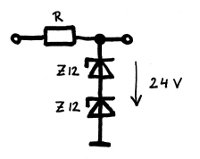 A ZPD12 means 12V zener voltage. The zener voltage of American 1N-types can not be recognized by the type. Zener diodes can be tested like a normal diode with a multimeter with diode-range. The zener function can not be checked with a multimeter. To test the zener function or to find out the zener voltage of an unknown zener diode a test setup with a power supply and a series resistor has to be build up. It is always wise to check the zener diode function when the electronic board is under voltage. With the minus lead of the voltmeter at ground the plus lead is connected to cathode. The measured voltage must be the zener voltage. Defect zener diodes are not very common. An unstable power supply usually has an other defect. Probably the series transistor makes trouble. When a zener diode is defect and this diode is not available, smaller zener diodes can be put in series in order to get the right voltage. Zener diodes can be used in series connection.